St. Brigid’s Church, Rosenallis is an attractive church which is seen on approaching the village from the town of Mountmellick. 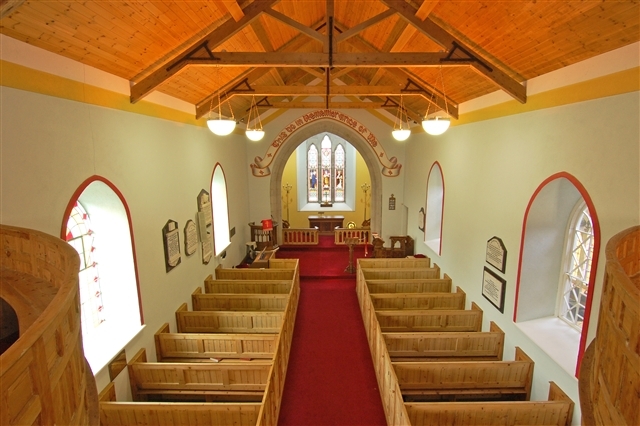 The village itself is situated on the foothills of the Slieve Bloom Mountains and has a long Christian heritage. 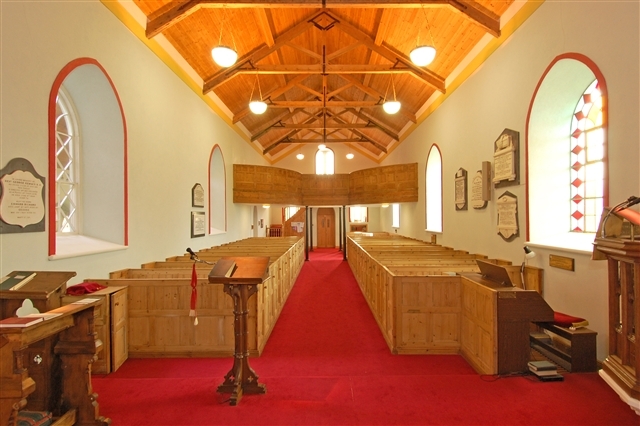 The parish is dedicated to St. Brigid of Kildare and is the older of two churches within the village dedicated to the saint. There is also a holy well in the centre of the village also bearing her name. William Bulfin “Rambles in Eirinn”, writes about St. Brigid’s well. He says “Quench your thirst at the village well, it is a spring more refreshing than the deepest draught of the rarest wine in Europe”. It is believed that there was a much earlier Christian settlement at the rear of the current church hall (known locally as the Green School) which had a round tower. The round tower was demolished in 1834 by the rector who stated that “it only indulged the curiosity of a number of cracked people called antiquarians and to serve as a habitation for jackdaws”. In the 1990’s, during the clearing and landscaping of the graveyard to the rear of the church, some early Celtic Christian stone artifacts were unearthed, including a “Shiela Na Gig” and small sandstone cross which are now in the national museum. The sandstone cross dates from the seventh – eighth century. The old name of the village was Oregon which is an anglicised version of O’Riagain. The name Rosenallis in any form wasn’t mentioned before 1420. The earliest recorded mention of a church here is from 1212 in a list of churches belonging to the Knights Hospitallers of St. John of Jerusalem which mentions Oregon. The foundations of a earlier Christian site is to be found covered over in the churchyard at the rear of the present building. The chancel was added by Joseph Welland in 1850. A tower and south aisle was added by Thomas Holbrook in 1870. The beautiful east window by Nathaniel Westlake representing the presentation is in his favourite colours of olive green, quiet blues and sandy ambers. 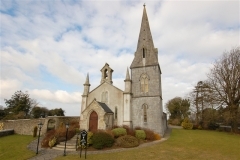 There is a mention in a past edition of The Guinness Book of Records of a Roger Byrne that is buried in the graveyard at the back of the church. He died in 1808 and it was said that he weighed 52 stone and held the record as Ireland’s heaviest man.